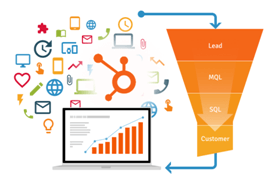 Sales qualified leads generation is never a straight-forward process. Sales transactions in the B2B world can take long, and even when prospects are interested in your company’s products, only a small portion of them are usually ready to make a commitment. Jeremy Miller talks about this in detail in his book “Sticky branding”. 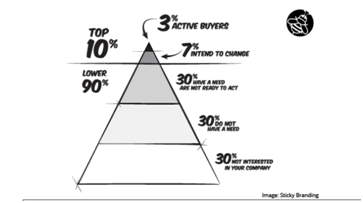 He explains that most of the time, only 3% of people are likely to buy from you in 30 to 90 days. He calls this the 3% rule. The remaining 97% can range anywhere from those not interested in your company, to those who can be converted with well-timed marketing activities such as email marketing, a phone call or content syndication. You have to slowly nurture the remaining leads until they are ready to convert. This is where the problem comes in for marketers. It is often the case that when potentials show interest in a company’s services, this interest can be confused for readiness to convert. But as we will show below, this is rarely the case. 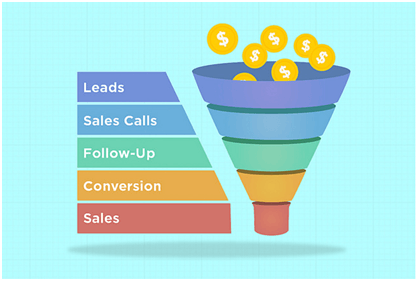 Marketing qualified leads are higher up the sales funnel and a lot of strategic lead nurturing is necessary to turn them into sales qualified leads. Before a prospect/lead becomes a paying customer, you have to develop a relationship with them. Channels such as websites, email, direct mail, and social media, allow you to create a robust content marketing campaign, providing information from the early stages of the buying cycle. Your content, (whether directly shared on your website or syndicated), will establish your brand as a thought leader, and increase trust way before leads become buyers. A case study in a lead nurturing report by Aberdeen group shows a 300% increase in marketing qualified leads, following an intensified lead nurturing campaign by a software company that was previously losing at least 90% of their leads. This goes to show that though there is always an urgency to generate revenue, hard selling may not be effective at the early stages of buyer interaction. Nurture first, before you make that ‘selling’ phone call. When is a Lead MQL or SQL and How Can You Nurture Your MQLs Into SQLs? What defines prospects in these groups either as marketing qualified leads or sales qualified leads is their readiness to purchase your product or service. They filled a form outlining specific pain points they think your product or service can help resolve. Their pain points are too inconveniencing to their business and they are prepared to spend on your product to solve their problems. They are a key decision maker in the company. You can tell this by their job designation in the form they filled. They are past the information gathering stage. They are ready to meet with your sales team, discuss the problem and go for the best solution. This group is highly important and should be contacted, by phone call, within minutes of their submission. A 2007 study on 600 companies found that chances of making contact with a lead are higher within the first 5 minutes. They decrease by up to 3000x if contact is made 5 hours later. You are most likely not the only company that this group of prospects is reaching out to, so email is not an option here. These are prospects generated from your cold-targeted lists and predictive analytics because they fit the buyer personas that you have created. If they pan out, they provide a lot of value in terms of conversions. They are not high on the priority list because they could take some time to convert. However, you should start your outreach, with a combination of email marketing and content syndication as soon as you receive the leads. The actions you take to convert MQLs to SQLs will depend on the engagement that said prospects had with your site. Their numerous visits suggest that they are still in the information gathering stage. They have read your blogs or responded to calls-to-action such as downloading, subscribing, signing in to a webinar, attending trade shows, etcetera. They are not ready to be contacted but have instead opted for receiving information on email. Clients in this group are essential, “shopping”, meaning they are also looking at the competition. You should reach out, via email, within days of the lead’s engagement. Before you send out any communication, determine whether or not the person gathering information has decision-making power. This will ensure your emails are going to the right person. These are people who stumble upon your website or advert by chance. Your service or brand piques their interest, but they are weak prospects who may or may not be interested. You may need to gather additional information about them before you take any action. Yet many companies do not include CTA in their web pages and even when they do, the majority do not make their CTA compelling. 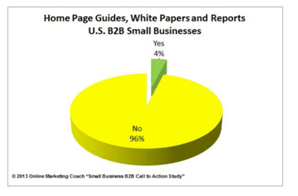 A study conducted on small b2b companies found that home pages of 96%of the companies surveyed did not feature relevant content such as white papers or how-to guides. Besides the “contact us” button, 70% did not have any other calls-to-action on their home pages. A website that features relevant content is a great asset for you to educate your prospects. More so, through content syndication, you can increase audience reach by posting your content on relevant websites. All your content should feature a strong call-to-action. “A strong CTA compels people to click on it. It leaves a memory in the user’s mind even when they’ve exited the landing page.” Neil Patel, founder of Crazy Egg. A well-timed email can be a powerful tool for converting prospects. There is no hard and fast rule for how many emails you should send a client. Only by split-testing can you tell whether your emailing strategy is working. A key example of this is Toptable, who conducted a test to measure the impact of sending too many emails to their customers. One group received 2 emails a week while the second group received 1 email. Test results after 3 months showed 86% higher open rates, 57% lower unsubscribe rate, and, increased bookings by up to 14% in the group that received fewer emails. This should be the first email you send leads. Thank them for visiting your site and offer them additional material. Additionally, encourage them to engage further with your company and website through calls-to-action such as sign up for a newsletter, attend a webinar, etcetera. Include a “contact us” link to schedule a call. This can be an email inviting prospects to events such as tradeshows, webinars, talks. If you have already progressed in your discussion, this email could be a follow up on their inquiry or their company’s pain points. How often you send your emails and how you space them will depend on your industry. You don’t have to sell your clients all the time. You can stay top-of-mind by educating them about your industry through your email sequence. Send them links to relevant news articles about your company and industry. Or, share a case study that will influence how they see your company. For advanced discussions, use this as an opportunity to touch on matters discussed in email 2. Phone calls should come in once a lead has been qualified through continued nurturing, and that lead is now a promising prospect. Due to the number of people involved in the b2b decision-making process, nurturing prospects into opportunity can take quite a while. Sales and marketing people should be prepared for this. Just because a prospect is willing to talk doesn’t mean you’ll get to wrap things up in one day (or even a week). It is not advisable to pester your prospects with phone calls, but you should do everything in your power to ensure you don’t lose their interest. Otherwise, all the work you put in to nurture the lead will be lost. Any phone call you make should edge your prospects towards the ‘Purchase’ call-to-action, through a mix of value and information. As well, phone calls provide a useful platform for continued fact-finding, to determine any changes in the prospect’s focus. Script the questions to be asked beforehand. The purpose of the call is to gather information. Questions should help you learn about the customer’s problem. Listen. Don’t talk over your clients. Let them tell you about their business pain points. Script follow up questions based on what they tell you. Avoid overselling your company. It’s likely the customer has already discovered you through different media, so unless they specifically ask questions to learn more, stick to the script. Recommend additional material that you tell them will answer a few of their questions or educate them further. When calling a prospect, the sales team should bring up all the client’s browsing history and email communication and leverage information from that history to close the sale. Collecting client analytics is important for this. Qualifying your leads is something that comes with practice. Every lead is different and they might not all fit in neat little boxes. However, when you know where to begin, you can start making decisions that are more precise and that generate increased sales. As with all other aspects in the online marketing world, speed is key. 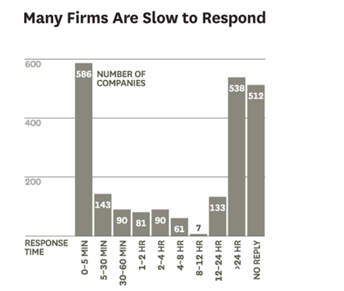 Harvard business review audited 2241 companies in the US, to measure how long they took to respond to leads. They found that only 37% of those companies responded within an hour. This results in leads going cold, and lots of lost revenue. Teams don’t follow up fast enough. Ask yourself: Are you retrieving leads from your CRM systems continuously or do you wait until they go cold? Though both marketing and sales teams play different roles in the lead nurturing process, a collaboration between the two teams is important for the success of the process. Otherwise, you end up with siloed teams making fragmented decisions and ultimately wasting money in doing the wrong things.